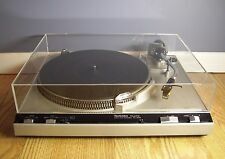 Technics SL 5200 Turntable. Will also fit Technics SL Q2, Technics SL Q3, Technics SL B1, Technics SL Q3, Technics SL 220, and Technics SL 230! Dust Cover for. 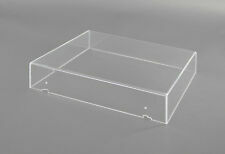 Vintage Unbranded Turntable Part: Smoked Acrylic Lid Cover - 17" x 12.75" x 4.5"
You will receive the exact item you see in the pictures. If you are interested in this dust cover you are oing to have to do a little math. The dust cover is in nice used condition. Minor scuffs scratches.